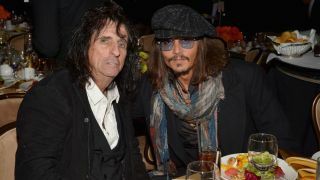 Alice Cooper and Joe Perry are to team up with actor Johnny Depp in supergroup Hollywood Vampires at a festival in Brazil. The trio will perform under the banner which was the name given to members of The Doors, The Who, The Beatles and Jimi Hendrix and Cooper who would often meet for drinks in LA in the 1970s. Cooper has recorded a covers album featuring tracks by members of the original Hollywood Vampires, and he’ll now take the songs to the live arena at the Rock In Rio festival in Rio De Janeiro in September. The band is scheduled to play on the same day as Queens Of The Stone Age and System Of A Down. Depp last month insisted he would never form his own band, saying the idea of movie stars doing so “sickens” him. He previously worked with Aerosmith man Perry on his Christmas album.